With this week designated as National Crime Victims’ Rights Week, the House began working through a package of bills designed to help protect victims of crime. Reporting suspected abuse is the best way to protect children. For more information, call the Department of Health’s toll-free ChildLine at 1-800-932-0313. Dairy farmers, milk haulers and public safety officials appeared before the House Agriculture and Rural Affairs Committee at the state Capitol on Wednesday to discuss legislation that would exempt milk trucks from weather-related commercial vehicle travel bans. House Bill 915 was introduced in response to the Wolf administration issuing disaster emergency declarations this winter in which commercial vehicles were banned three times from some or all of the state’s interstate highways in anticipation of snow or ice accumulations. The ban created major challenges for milk haulers and the state’s already-struggling dairy farmers who have limited capacity for storing their milk, not to mention cows that continue to produce milk regardless of the weather. When milk trucks can’t get to the farms, farmers are left with no other option than to dump the milk. The meeting gave the dairy farmers and milk haulers the opportunity to share their experiences and concerns not only with the members of the committee but also with state officials who are involved in making the decisions about issuing travel bans. The meeting generated a good discussion of the issue. My hope is we can all work together to find a solution that protects public safety without overburdening our dairy farmers or milk haulers. 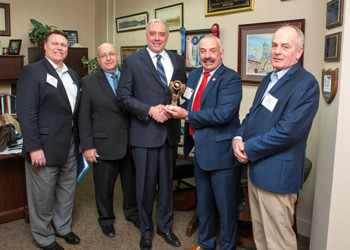 This week, I was honored by the Associated Builders and Contractors (ABC). I was given an A+ rating for my continued support to ABC and its merit shop as well as contracting for free enterprise. Pictured with me, from left, are: Nevin Weaver, NR Weaver Masonry; Dennis Campbell, Heim Construction Company; Edward Nescot, Fairfield Company; and David Neslund, Triangle Refrigeration Company. Bronson Garber celebrated another fantastic season on the mats. The Upper Dauphin High School senior became the first four-time state wrestling medalist in school history after placing third in the 126-pound weight class at this year’s PIAA State Wrestling Tournament. Dedication, determination and hardworking may best describe Bronson. He is the first person to arrive at practice and the last person to leave. This season, he finished with a 42-5 record and overall had an incredible 171-20 mark. 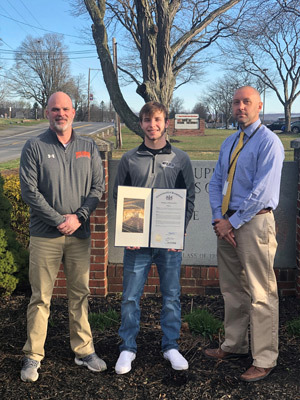 I was honored to present him with a House of Representatives citation for his outstanding accomplishments in his wrestling career at Upper Dauphin. Congratulations Bronson. Best of luck in your future endeavors. Bronson is flanked by his wrestling coach Todd Rupp (left) and Upper Dauphin High School Principal Jared Shade. This week, the Pennsylvania Game Commission voted to move the opening day of deer rifle hunting to the first Saturday after Thanksgiving. Since 1963, deer rifle hunting in Pennsylvania has started the Monday after Thanksgiving. When the commission first proposed the change in January, it said the move was an attempt to stay current with changing hunting demographics and would create more opportunities for hunters. The deadline to apply for Pennsylvania Turnpike Commission summer positions is Monday, April 15. Positions are available for toll collection, maintenance, clerical and engineering employees. You can provide your input by taking PennDOT’s 10-question survey that asks about how often you travel in poor weather, how you rate PennDOT’s winter service, and how you rank its snow-removal priorities. The survey also asks how you receive PennDOT’s roadway information, and if you use Pennsylvania’s 511 PA system for traffic and incident information, and winter roadway conditions.